Members of the community all participate to make the event happen. From left: BAYarts board member Marianna Oro, staff member Melanie Harlan, volunteer Lori Forrester. 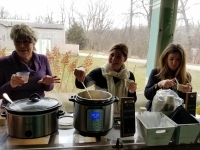 The annual SOUPer Bowl is upon Bay Village once again. It is the event at BAYarts that coincides with a date close to the actual Super Bowl; this year it will be Saturday, Feb 2, from 11:30 am to 1:30 pm. The concept is as it sounds: a soup tasting event. However, being an art center with a new ceramic center, BAYarts goes a step further. With every ticket, people are also given a handmade ceramic bowl. "It is our third year for this popular event. It brings families in to enjoy a wide range of delicious homemade soups that chase away the winter chills!" said Pam Mills of BAYarts Special Projects. The event benefits the BAYarts Scholarship Fund this year. "It supports our BAYarts Scholarship Fund for students to attend BAYarts classes," said BAYarts Executive Director Nancy Heaton. "The fund was founded in memory of Ruth Purdy, an artist and teacher at Bay Middle School, by her friends and family and has served dozens of families since 2013." "The education scholarship was established to provide students with art-based educational experiences, and to inspire student achievement," explained BAYarts Education Director Linda Goik. The classes at BAYarts run the gamut from ceramics to watercolor. There is also a bake sale that goes on during the event. BAYarts' education assistant Melanie Harlan was a star last year in bringing her succulent-themed cupcakes. "Every detail helps make it a success," said Mills. Tickets are $20 and may be purchased from the Upcoming Events page on bayarts.net.